ASEAN Defence Ministers’ Meeting with 8 dialogue partners(1) (ADMM- Plus) is a special, dynamic mechanism of cooperation that makes significant contributions to maintaining peace and stability in the region. As one of the initiators of the Meeting and the first one to hold it, Vietnam has actively and greatly contributed to this important mechanism of cooperation. 1. Within the framework of defence cooperation between ASEAN and its dialogue partners, on October 24th 2017, the 4th ADMM-Plus was organized in Clark city, the Philippines. The Meeting, along with other ASEAN-led mechanisms of cooperation (ASEAN + 1, ASEAN + 3, ARF, etc. 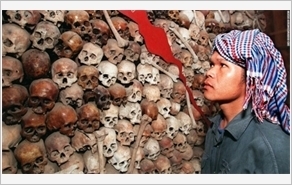 ), has contributed to boosting defence and security cooperation in both the Southeast Asia and the Asia-Pacific region. ADMM-Plus aims to build confidence, foster cooperation, enhance the capability to neutralize challenges, create and maintain peaceful, stable environment in the region. Since its inception (2010, Vietnam), ADMM-Plus has proved itself to be an important mechanism and a top forum which is greatly boosting dialogue and cooperation between ASEAN and its dialogue partners, contributing to maintaining common stability in the Asia-Pacific region and worldwide. 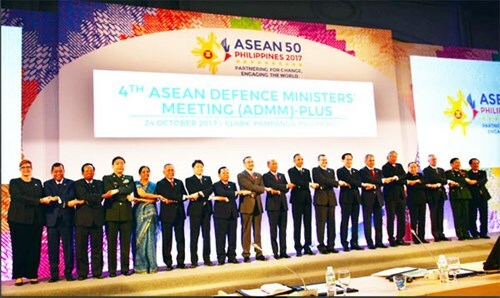 Consequently, the 4th ADMM-Plus continued to witness the participation of all ASEAN defence chiefs as well as defence ministers of the U.S., Russia, India, Japan, and China. The 4th ADMM-Plus focused on reviewing the task performance of experts’ working groups according to action plans set by the 3rd ADMM-Plus and spent a lot of time on discussing issues related to regional and global defence and security. In this regard, heads of delegations at this ADMM-Plus placed stress on the central role of ASEAN and highly appreciated the results of cooperation within the framework of ADMM-Plus. At the same time, representatives of member states also expressed their concern over increased terrorist attacks and extreme violence, recent developments in the Korean peninsula and non-traditional security challenges, such as cyber security, trans-national crime, smuggling, drugs, etc. It should be noted that special attention was paid to maritime security. Many countries laid emphasis on observing international law in maritime disputes, while demonstrating support for settlement of disputes by peaceful means and in accordance with international law, particularly the UN Convention on the Law of the Sea 1982. As regards the issue of the East Sea, the Meeting confirmed the importance of seriously implementing the Declaration of the Conduct of Parties in the South China Sea (the East Sea) (DOC) and soon completing the Code of Conduct (COC) after an agreement on the framework of this code. In spite of several differences, the 4th ADMM-Plus achieved important results, aiming at building strategic trust and unfeigned cooperation to create a peaceful, stable environment for development in the region and the world. 2. As an active, responsible member of the international community and the ADMM-Plus framework in particular, Vietnam proactively contributed important initiatives to establishing, maintaining and improving the efficiency of regional multilateral defence cooperation. Since the first ADMM was hosted by Malaysia in 2006, Vietnam has actively, proactively taken part in this Meeting. Taking the Chairmanship of ASEAN in 2010, Vietnam hosted 17 important regional military and defence conferences, while proactively proposing a lot of initiatives appropriate to the priority given to building the ASEAN Political - Security Community. Notably, Vietnam’s introduction, realization and successful organization of the 1st ADMM-Plus have made a breakthrough and become an important precondition for the mechanism of defence cooperation between ASEAN and its dialogue partners, marking the birth of a prospective regional security structure and opening a practical, effective mechanism of multilateral defence cooperation. In 2011, Vietnam played the core role in including the issue of East Sea in the Joint Declaration of the 5th ADMM with the strong consensus among ASEAN Member States. The Joint Declaration “reaffirms ASEAN Member States’ commitment to fully and effectively implement the Declaration on the Conduct of the Parties in the South China Sea (also known as the East Sea), and to work towards the adoption of a regional Code of Conduct in the South China Sea (the East Sea) that would further promote peace and stability in the region”. That was the first time the issue of East Sea was included in the Joint Declaration of an ADMM. On the one hand, that reflects a sense of unity, consensus and responsibility of the ADMM towards encouraging ASEAN defence and security cooperation and regional integration. On the other hand, that expresses Vietnam’s viewpoints on building trust, maintaining motivation for ASEAN Member States to harmonize differences, and achieving a consensus in settling the issue of East Sea. Within the framework of ADMM-Plus, Vietnam proactively participated in discussions, counselled and made significant contribution to the settlement of regional key issues so as to foster the process of multilateral defence cooperation, namely the ASEAN Defence Senior Officials Meeting (ADSOM), the ASEAN Defence Senior Officials Working Group (ADSOM + WG) and Experts’ Working Group (EWG). We mainly took part in the fields which are also our strengths in terms force and means, aiming at dealing with defence and security-related difficulties and challenges of the country and the region. Noticeably, we proposed the establishment of the 6th Experts Working Group on “Humanitarian Mine Action” and co-chaired with India in the implementation of this initiative, while co-hosting the Experts Working Group on “Humanitarian Assistance and Disaster Relief (HADR)” with China. It also actively took part in successfully fulfilling humanitarian assistance and disaster relief/military medicine exercises in Brunei 2013 and in Thailand 2016 as well as the Force 18 Field Training Exercise on Humanitarian Mine Action and Peacekeeping Operations hosted by India 2016. After the Exercise Force 18, Indian experts said: “Vietnam has actively participated in and greatly contributed to the success of the exercise. Vietnam’s Engineers are the most experienced in bomb and mine disposal among the participants’.” That has confirmed the role, status and increased contribution of Vietnam in the mechanism of defence cooperation within ASEAN and Asia-Pacific region. At the 4th ADMM-Plus, General Ngo Xuan Lich, Vietnamese Minister of National Defence, proactively shared and expressed Vietnam’s views on regional emerging issues, such as security instability, risk of conflict, terrorism, climate change, sea disputes, and non-traditional security threats as well. To effectively tackle those issues, Vietnam suggested countries would join hand in settling them wholeheartedly and responsibly. It believed that the matter of utmost importance was to preserve unity and promote the central role of ASEAN. Moreover, settlement of the issues must be grounded in the “strategic trust” under the common legal framework, and a country shall not disregard the benefits of its neighbouring countries and partners for the sake of its own. Keeping a close watch on reality, Vietnam proposed directions for settling violations of fishermen in the overlapping seas by taking education and propagation as the main method, not treating them inhumanely or using violence while awaiting a uniform, long-term solution. Those proposals of Vietnam were acknowledged, highly appreciated and supported by the Meeting. 3. Currently, the regional architecture is on the move and effected by the geopolitical and geoeconomic strategic competition among major powers. Disputes over territorial sovereignty and the issues related to maritime and aeronautical security and safety, etc., directly impact on regional security and the people’s life. Meanwhile, non-traditional security threats, such as energy security, international terrorism, climate change, natural disaster, and so on, are impacting on the whole Community, whereby one country can’t solve by itself. As a result, defence cooperation among countries in general and within the framework of ADMM-Plus in particular, serve as an overly useful mechanism to each country and the entire region to respond to traditional and non-traditional security threats at global level. To improve the effectiveness of regional defence cooperation in line with the particularities of the country, due attention should be paid to the following points. First, it is necessary to comprehend and seriously implement the Party’s line on defence diplomacy and cooperation; to raise cadres and troops’ awareness of international integration and defence diplomacy, including mechanisms of multilateral defence cooperation in the new situation. Second, great important should be attached to continuing to further study, assess and grasp regional and global situation, as well as the partners' situation to counsel the Party and the State to formulate policies and strategies on defence diplomacy in line with the benefits of the country and the whole Community gained from the mechanisms of multilateral defence cooperation in which Vietnam is a participant; to proactively combating trends of competition and compromise as well as policies against national and regional benefits. Third, due attention should be paid to completing the structure of agencies and units in charge of defence diplomacy and improving professional competence of their staff; to detecting and training qualified cadres, particularly those who are expert in foreign languages and aggregate knowledge in line with the requirements set by bilateral and multilateral defence cooperation and diplomacy. Fourth, it is important to step up the work of communications and propagation to disseminate the image and humans of Vietnam as well as its peaceful national defence at multilateral forums and important international events; to actively fight against distortions undermining Vietnam’s prestige and status in the international arena.